The verdict for the Deeper Smart Sonar PRO Series fish finder goes out in the positive for novice users but in the negative for experts. The beginners were happy on the fact that it maps out a lakebed but they did not realize that it did not help them to find fish as it is meant to be. Various different types of fish finders are available in the market. Most of them are able to provide you the right parameters for finding the fish. The improvement in technology and advancement in the features of fish finders has made everything much easier and better. The Deeper Smart Sonar PRO Series is another great fish finder which does not work like the traditional fishfinders. It comes with its own application and can be used wirelessly as well. How does it work and what is more about it that you need to know? We will discuss that in the review below. Read more to find out. 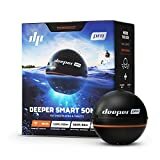 The Deeper Smart Sonar PRO is a wireless fish finder and works with the help of a Wi-Fi connection. The Wi-Fi must be connected to the device and the smartphone or tablet you own. With the help of the application provided by Deeper, you would be able to have access to different types of functions such as mapping, showing a good estimate of position of the fish, Solunar Forecast Calendar, Fishing Notes, Offline Maps, Weather Forecast, Camera, Day/Night Screen Color Mode, Social Media Sharing and other useful qualities. It works both in offline and online mode easily. This is a dual frequency SONAR which means that it is going to be much more accurate and easy to use compared to a conventional finder. It works in both saltwater as well as freshwater. The best thing is that it has a small and round castable design which means you can easily use it as it would float over water. This Pro Series fish finder is ultra-light when it comes to weight and the battery time is almost 6 hours on a single charge. The entire package includes Deeper Smart Sonar PRO, USB Wire, Neoprene Carry Pouch, 2 Attachment bolts, Quick Guide, Safe Usage and Regulations Manuals as well. The verdict for the Deeper Smart Sonar PRO Series fish finder goes out in the positive for novice users but in the negative for experts. The beginners were happy on the fact that it maps out a lakebed but they did not realize that it did not help them to find fish as it is meant to be. Yes! It is quite helpful and works in a good manner but then again, there can be several things which the professionals might feel that are lacking in this fish finder. For a few professionals, it may be a fine one as well. It depends on how and what type of fishing and lake size you are up to. Get it from amazon.com if you feel that this is the right one for you.